Western Spur Bathroom Towel Ring Rustic Cast Iron is a cast iron western towel rack with massive 8 inch ring and storage for hair and hand towels. 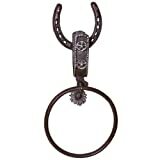 This excellent rustic cast iron western-fashion towel ring has a wall plate cast in the form of a horseshoe, a big eight inch chrome-plated towel ring for bath towels, a cast-iron replica boot spur strap to hold hair and hand towels or washrags, and the eight-point spur spins just like a true cowboy boot spur. This is a large high quality western decor item with a stunning rugged antique brown enamel finish for many years of support in your bathroom. Include wonderful cowboy really feel to your bath with this massive rustic western towel rack, or give the towel ring to cowboy lovers, ranch collectors, pals and family members. Western bathroom towel ring measures 15 inches all round from the prime of the horseshoe to the bottom of the chrome towel ring (The spur and horseshoe wall plate measures 10 inches). Cast iron towel ring weighs 2lbs.